4-7-12 Merger is announced between 4 Premier NJ Swimming Clubs: Elite Swim Club, Scarlet Aquatic Club, NJ Wave and Bayonne Mermaids/Starfish. See news letter under "News" tab! Elite Swimming: Cultivating Excellence in Academics, Character and Swimming. 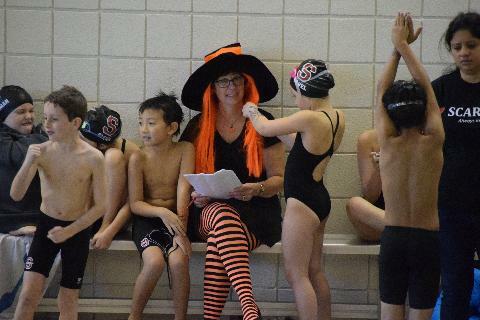 The mission of the Scarlet Aquatics-Elite Division is to teach competitive swimming to serious swimmers within a positive environment. To succeed at it?s mission, Elite's training program is set up like a school. There are four distinct training levels-similar to the traditional pre-school, grammar school, middle and high school educational format. The four training levels are subdivided into 8 distinct training groups. The 5 middle level training groups are each broken into at least two sub groups-thus there are at least 13 distinct training levels within Scarlet-Elite during a training season. Each training group coach teaches and reinforces skills that are the foundation of the next training group. Scarlet-Elite is a meritocracy. Swimmers are promoted to the next level based upon four distinct yet interlocking criteria: 1) attendance at practice 2) intensity/focus at practice 3) stroke efficiency and 4) fast times. The 1st three criteria must be present for a swimmer to be promoted to the next sub group or training level. The fourth criteria (fast times) will undoubtedly be the result of the 1st three criteria. Members of the Scarlet Aquatics-Elite Division are Elite People. Each swimmer in the Marlin, Wavebuster and Senior Training Programs are required to behave according to Elite?s Code of Conduct (a signed contract between the swimmer and the club that addresses behavior expectations). All Elite swimmers are expected to act in a responsible manner at all times-not just at swim practice or an Elite function. Illegal drugs, disruptive behavior and physical aggression are not permitted behavior traits of Elite swimmers under any circumstance. Not coincidentally, most Elite swimmers are also excellent students. 4 Premier Teams Announce Merger!! !